As Australia won 12th test series against India in the 24 test series they have played so far, here is the world records, bilateral series records, batting, bowling and partnership statistics emerging from the series that can be termed as the series of Captains. The series had 15 100+ partnerships and better all-round performances of Aussies is evident in the statistics. Kohli became the first captain to score 3 consecutive century on debut as captain. Smith became the second player after Kallis to score centuries in all the tests of a series. Ashwin became the fastest Indian to reach a double of 1000 runs and 100 test wickets. 0/45 in 3 overs by Umesh Yadav is the worst bowling performance ever. Warner became the 5th batsman to score centuries in both innings TWICE in a year. 1st 200+ partnership at MCG for 4th wicket by batsmen from any team. 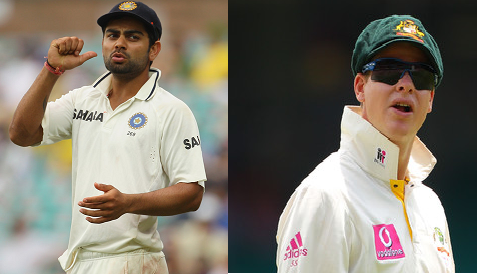 After 90 years 200+ partnership at MCG by any overseas pair. India conceded its 6th 500+ total in 2014 equalling the record of England (2006). 4th century helped Kohli equal Indian record of Gavaskar for maximum centuries in a test series. 4 centuries make Kohli join the likes of Herbert Sutcliffe and Wally Hammond as the third visiting batsmen to achieve the feat in a series at Australia. 1st Time 6 Australians scored 50+ runs in an innings. 2nd Time (after South Africa in 2003-04 vs West Indies) a team has scored 500+ runs in every test of the series. 4th time (out of totall 6 times) Indians conceded 6 50+ scores in a test innings. 24th instance of 4 bowlers conceding 100+ runs in an innings gets India second behind England (32). 769 runs by Smith is new record breaking Bradaman’s 715 runs record. 692 by Kohli is India’s best breaking Dravid’s record. 4th 50 makes Murali Vijay the first Indian opener in Australia to achieve the feat breaking Gavaskar’s 3 50s record. 200 run partnership between Warner and Rogers is the 4th in an IND-AUS test series for 1st wicket. Results: 1st Test Aus won by 48 runs, 2nd Test Aus won by 4 wickets. India got 32nd test captain. Australia got 45th test captain. 29 half-centuries scored, 6 by Rogers and 4 by Murali Vijay. Top scorers: Smith 769, Kohli, 692, Vijay 4482, Warner 427, Rogers 417, Rahane 399 (All batted 8 innings). 9 batsmen scored 200+ runs 9 more scored 100-200 runs. 192 by Smith is the highest score of the series. 10 Australians aggregared 100+ runs. 8 Indians aggregared 100+ runs. 13 players scored duck. Raina is the only one to get a pair. Lyon grabbed 2nd 5-wicket haul against India. Most successful bowlers: Lyon 23 in 4 tests, Shami 15, Johnson 13, Hazlewood and Ashwin 12 each, Umesh Yadav 11, Harris 10 in 3 tests. 12/286 of Lyon is the only 10+ wicket haul of the series. 7/152 by Lyon is the best bowling in an innings of the series. 4 occasions of 5+ wicket haul in an innings. Lyon had 2, Shami and Hazlewood had one each. 223.4 overs bowled by Lyon makes him the only bowler to bowl 200+ overs in the series. Next highest is 126.3 by Shami. 7th occasion when Dhoni had 5+ dismissals in a Test innings. 21 catches 1 stumps by Haddin. 13 catches 1 stumps by Dhoni. 7 catches by Watson, 6 by Smith make them the fielders with most catches in the series. 5 catches make Dhawan the Indian fielder with most catches. Australia scored 10 and India had 5 100+ partnerships.